Bird update: The robin family seems to have left their nest. Hopefully, everyone is safe and sound, just relocated. We’ll look forward to a new family next year. Earlier this week, we were watching this Mark Bittman video that TiVo downloads from the New York Times. He talked about making pork and fennel burgers, like an Italian sausage burger. We happened to have a package of sweet Italian sausage meat from Chestnut Farms. The day before, we were discussing what we could do with it that was summery. Ta-da! Mark Bittman offered the perfect inspiration. Howard was in charge of the burgers. I was in charge of the sides. Being the Side Salad Queen, I came up with an orzo salad with an Italian flair. I liked the surprise of the toasted pine nuts. I made the salad, so I knew they were there. 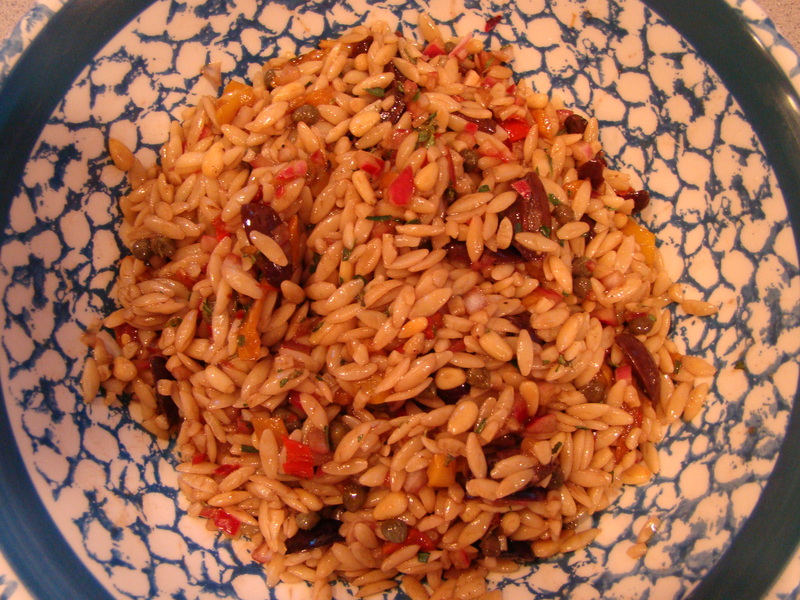 Because their shape looked more or less like the orzo, I didn’t really notice them on the fork. But there was an unexpected burst of flavor as I ate. The burgers were yummy, but we thought they would be improved by roasted or grilled peppers and onions. Tonight, to go with the leftover burgers we reheated, we topped the burgers with sauteed onions and roasted peppers. It hit the spot. Toss all the ingredients in a large bowl with Balsamic Dressing. Posted on 25 June 2010, in General and tagged salad. Bookmark the permalink. Leave a comment.